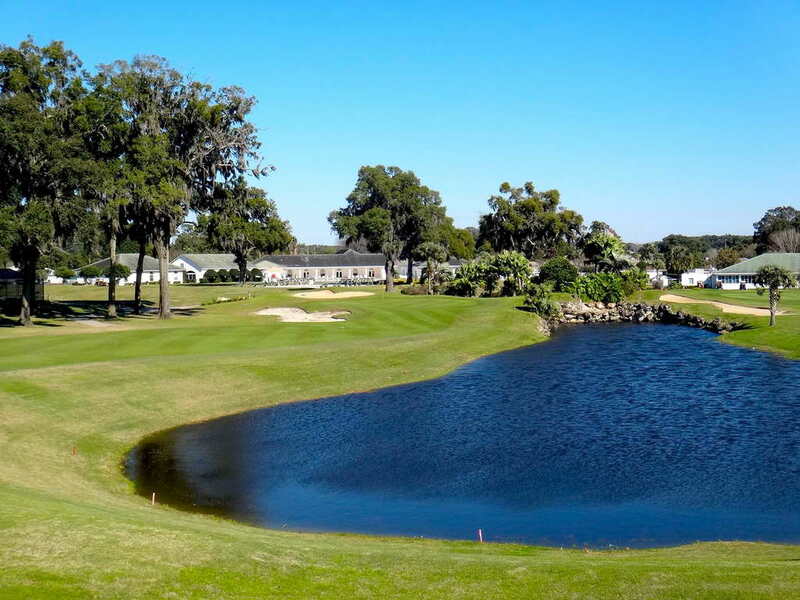 Ocala Palms Golf Course is a unique eighteen-hole layout, measuring 6500 yards (par 72) from the back tees. Before or after your round, you’ll find the Ocala Palms Cafe the perfect place to enjoy a cold beverage and tasty snacks as you relive the highlights of rounds past and present. Ocala Palms offers an excellent value in membership and is the perfect place to make new freinds while enjoying our facilities. 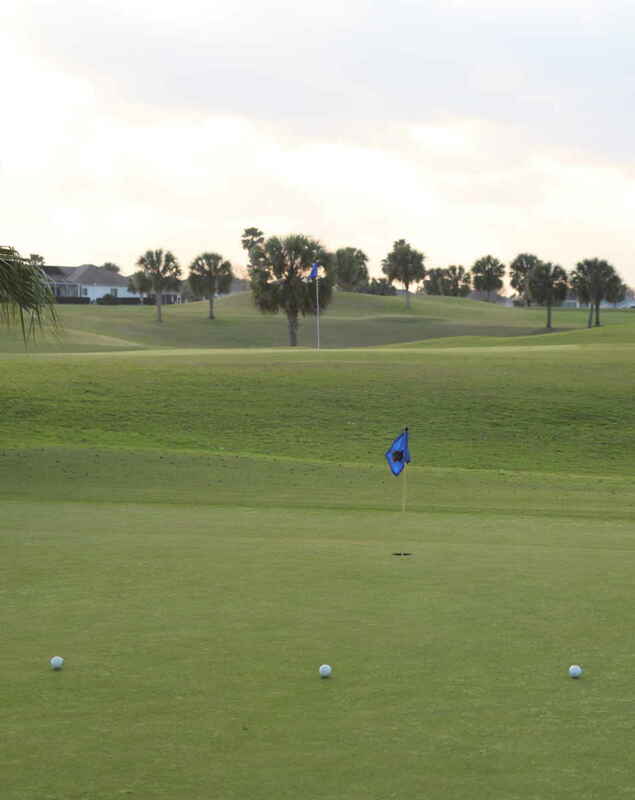 Tee Times can be booked online 24/7 or by phone at (352) 732-4653. All rates include cart and all prices are taxable. 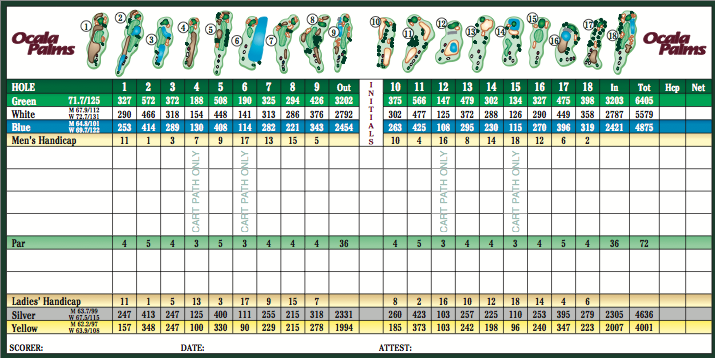 Par 5 measuring 572 yards, rated as the most difficult hole. A water hazard is located short and right of the fairway when shooting from the tips, not in play from other tees. Additional trouble can be found from the water located over the bridge or from the bunker to the left of the green. Tricky par 4 measuring 372 yards. Water is located short and right of the fairway. Tee shots should be aimed down the left side of the fairway. Tee shots hit 20 yards beyond the 150 yard marker on the right side of the fairway, will find a water hazard. To reach the green approach shots must carry the hazard. For the faint of heart, there is a bail out area to the left of the green. Tough green to putt. Uphill 188 yard par 3. Usually plays longer than its measured yardage. Try to stay below the hole on the green and avoid the bunkers left and right. Relatively short, straight par 5 at 508 yards. Avoid bunker left of fairway with tee shot. Excess roll if you can reach the top of the hill. There is a drainage retention area left and short of the green. 190 yard par 3 with bunker directly in front of the green. You probably should consider hitting one more club because you are hitting your tee shot to an elevated green, but beware of the bunker behind the green. 325 yard par 4 that doglegs right. Stay left of the bunker. Short to medium iron required for second shot to elevated green. Avoid bunker short left of green. Short 294 yard par 4 dogleg right. Stay left of palm trees on right guarding the corner. If you decide to try and drive the green, be careful of out of bounds to the right and over the green. Bunkers can be found straight through the fairway and just over the green. Good finishing hole for the front 9. 426 yard par 4 with an abundance of trouble. Avoid bunkers on left and water to the right. Medium iron required for second shot. Green has a false front that prevents many balls from running up onto the green. Straight away 375 yard par 4 to begin the back 9. Fairway bunker on right side of the fairway and a retention area left. Greenside bunker on the right. Long dogleg left 566 yard par 5. Greenside bunkers on left and right make it difficult to hit this green in two. Stay right side of fairway. Picturesque, 147 yard par 3. Small bunker located long and left of the green. Long difficult par 4 measuring 479 from the championship tees. There is one bunker to the right of the fairway at the 150 yards from the green. A drainage area collects balls that venture too far ahead of the 150 yard marker in the fairway. The green is sloped from back to front. Short 302 yard par 4. However, don’t let the short length fool you into thinking this is an easy hole. A drainage area lies through the fairway and the green is surrounded by water on three sides. Short par 3 measuring only 134 yards. However, this hole is located at the highest elevation on the course allowing the wind to wreak havoc on poorly struck golf balls. Balls that land short of the putting surface will not run up the false front. 327 yard par 4 with water left and out of bounds to the right. Narrow green that should be approached with a short iron or wedge. Straight away par 5 475 yards grip it and rip it. Bunkers protect the green in front. Tough finishing hole 398 yards. Trouble is lurking everywhere. Out of bounds leftand fairway bunkers on the left and right. Tee shot should favor the right shot for an easier approach to the green.